Defections from both parties have forced them to change their Brexit policies. The United Kingdom is scheduled to leave the European Union (EU) in four weeks’ time, and yet, on the surface, it seems like little progress has been made. Behind the scenes, party defections and political infighting have opened up the possibility that the scheduled departure could be delayed or, even more astonishingly, completely reversed. 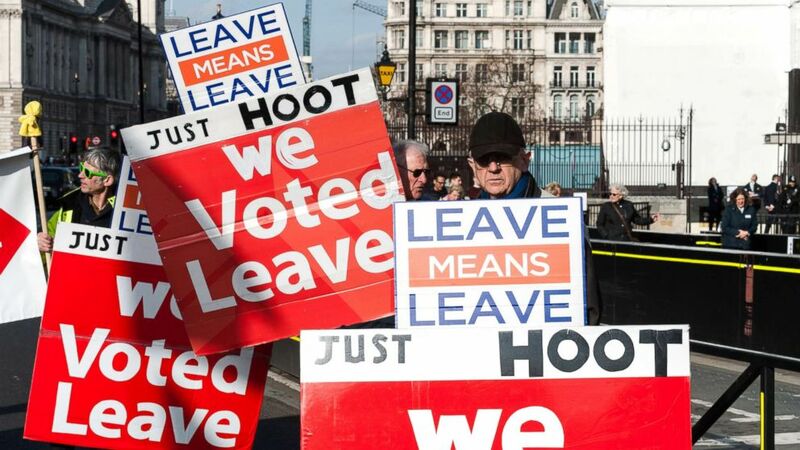 Brexit remains an incredibly divisive issue in the U.K., and as the deadline looms it is now firmly in the hands of British lawmakers to deliver on the result of the referendum in 2016, which saw "leave" beat "remain" by 52 to 48 percent. On March 12, U.K. lawmakers will once again have a chance to vote on Theresa May’s Brexit deal, the controversial withdrawal agreement that she has spent the better part of two years negotiating with EU leaders. The prime minister has promised to negotiate a better deal than the one that was defeated in Parliament by a historic 230 votes on Jan. 15. For the most part, however, the deal is likely to be the same, as the European Commission President Jean-Claude Juncker has repeatedly said the EU is “not in a position to agree to anything that changes” the deal. (Wiktor Szymanowicz/NurPhoto via ZUMA Press) Pro-Brexit supporters protest outside the Houses of Parliament in London as they campaign for a no deal Brexit and swift departure from the EU on the World Trade Organisation (WTO) rules on Feb. 13, 2019. With the deadline for exiting the EU fast approaching on March 29, however, some lawmakers may change their votes this time around. However, if the government loses the vote on March 12, lawmakers will get a chance to vote on the option of leaving the EU with “no deal.” It is highly unlikely that this will pass, as politicians and business leaders alike have warned that a no-deal Brexit would have catastrophic effects on the British economy. Some people have even been stockpiling food and medicine in the event of no deal. If the U.K. Parliament votes against no deal, May has promised that the government will request an extension to the Brexit deadline from the EU to give lawmakers more time to come to an agreement. This would be a “deep humiliation” for the prime minister, according to Dunn. Over the past two years, May has repeatedly stated that the U.K. will leave the EU on March 29. So what’s changed? A number of major defections from the U.K.’s two main parties — May’s Conservatives and Jeremy Corbyn’s socialist Labour Party — have shaken up the Brexit process that appeared to be stagnating. 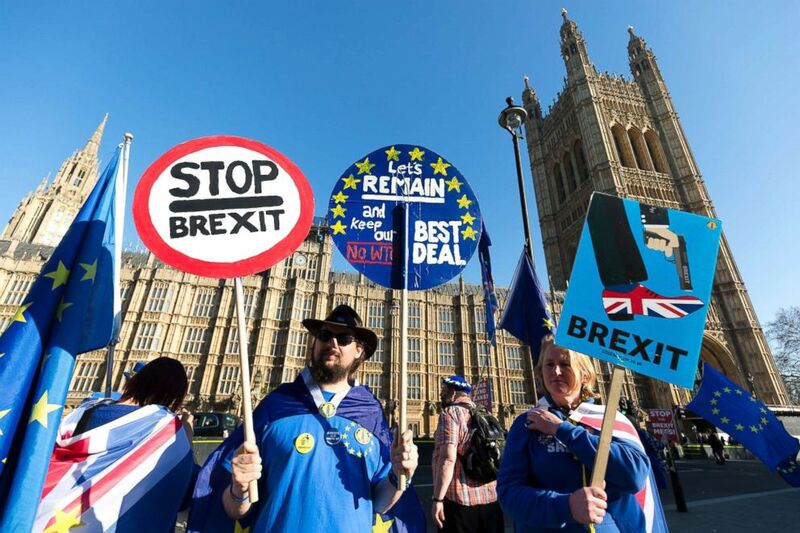 (Vickie Flores/EPA via Shutterstock) Anti Brexit protesters stage a protest outside the British Houses of Parliament in Westminster, central London, Feb. 25, 2019. 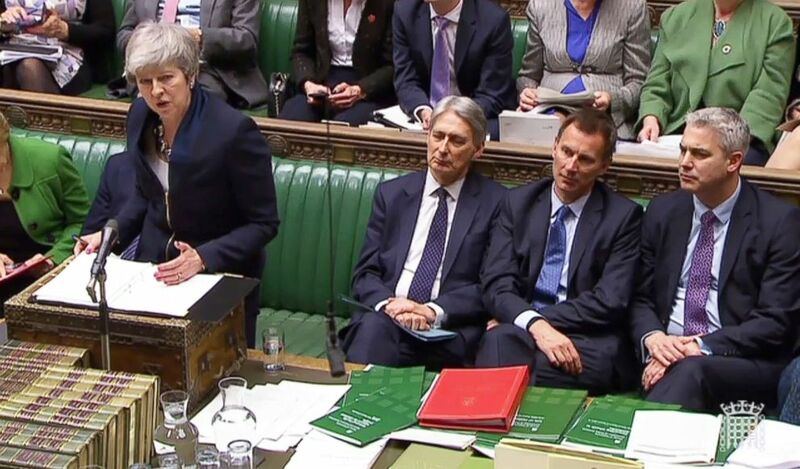 (PRU via AFP/Getty Images) A video grab from footage broadcast by the UK Parliament's Parliamentary Recording Unit shows Britain's Prime Minister Theresa May as she makes a statement to the House of Commons in London, Feb.26, 2019. On Feb. 18, seven Labour Members of Parliament (MPs) dramatically left the Labour party. Led by Chuka Umunna MP, they formed an organization called The Independent Group (TIG) and said they could no longer be part of Jeremy Corbyn’s Labour party because it had not backed a second Brexit referendum and had mishandled allegations of anti-Semitism. TIG were then joined by three pro-European Conservative member MPs from Theresa May’s Conservative Party, saying they could not support Theresa May’s Brexit policy and the rise in influence of the party’s right-wing. The new group claims that it hopes to fill the center ground of British politics by “pursu[ing] policies that are evidence-based, not led by ideology.” Among their main goals is to have a second referendum on exiting the EU. So, in order to stave off further resignations, Theresa May has agreed to delay Brexit if Parliament votes against her deal (and if there is no deal). 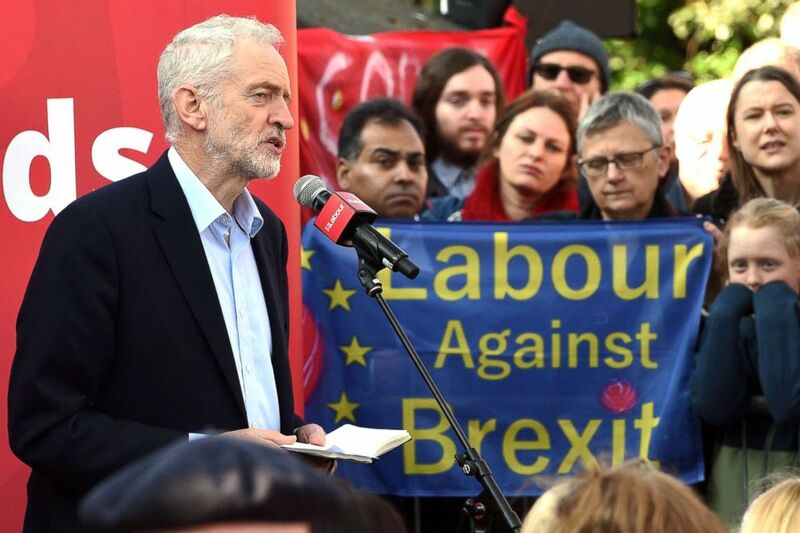 The leader of the Labour Party, Jeremy Corbyn, has now decided to back a second referendum if his own “soft” version of Brexit cannot get through Parliament — in order to prevent more MPs from his own party from leaving the party. It is not yet clear what would be on the ballot paper, but it would likely be a case of Theresa May’s deal versus remaining in the EU. (Oli Scarff/AFP/Getty Images) In this file photo taken on Feb. 23, 2019, Opposition Labour party leader Jeremy Corbyn addresses at a rally, in Broxtowe, central England. For now, the chances of U.K. lawmakers voting for a second referendum are low. “At the moment the parliamentary arithmetic isn’t there for it,” according to Dunn, though this could change after Brexit is delayed. “If the binary choice in front of Theresa May is either a no-deal Brexit or her deal with a second referendum attached to it, these sort of choices are choices between frying pans and fires [for the government],” he said. The government, meanwhile, remains hopeful that these circumstances will be avoided by winning the vote on March 12th. 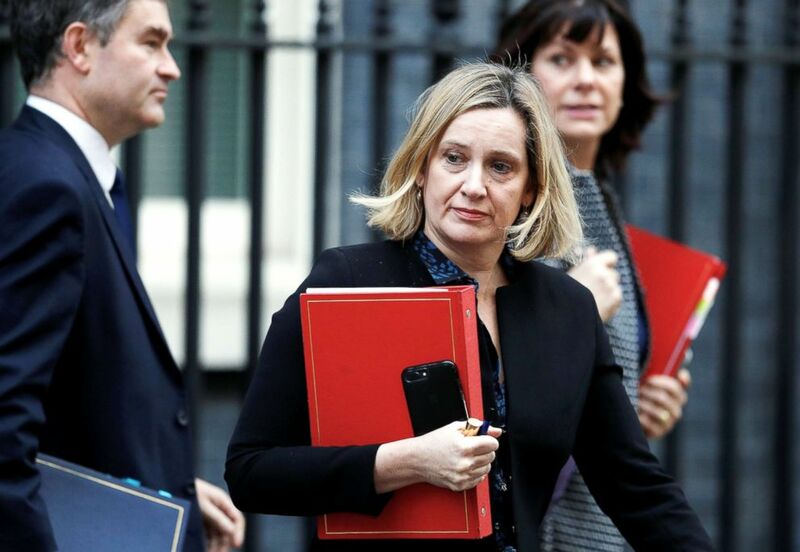 (Peter Nicholls/Reuters) Britain's Secretary of State for Justice David Gauke, Britain's Secretary of State for Work and Pensions Amber Rudd and Britain's Minister of State for Energy and Clean Growth Claire Perry are seen outside Downing Street in London, Feb. 26, 2019.